A Rancher XL in GTA V.. 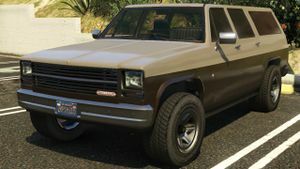 The Declasse Rancher XL is a four-door off-road SUV in Grand Theft Auto V. It is a four-door derivative of the Rancher from Grand Theft Auto IV, and it is based on the 1986-1991 Chevrolet Suburban. It is a method of transport by the Ludendorff Police Department, and it is one of the ten special snowy vehicles to appear in North Yankton. Like the Rancher of the GTA III Era, the tailgate is hinged from the top. A Rancher XL used by the Ludendorff Police Department. In the Prologue, used by the Ludendorff Police Department. Also used by Michael Townley and Trevor Philips as their getaway vehicle in the same mission. Granger: a Declasse SUV based on the 2007-2014 Chevrolet Suburban. FBI Rancher: Another four-door version of the Rancher. This page was last modified on 3 July 2014, at 20:22.